Things are not so stellar for Mike Stellar. He is stunned when his parents inform him that he has only eight hours to pack before they move to Mars. Despite the fact that he suspects his parents are involved in a major sabotage plot; that the only person who believes him is a girl who won’t shut up; and that his mother’s assistant seems to be spying on Mike’s every move, Mike is dealing with the same things that every eleven-year-old deals with: bad cafeteria food, a strict limitation on his electronic use, and a teacher who is so old-fashioned she must be from the year 2099. K.A. makes her home in Austin. Check out K.A. Holt’s Online Disaster. As a youngster, I was a voracious reader. I rushed through schoolwork so that I could read at my desk. I stole my parents’ books so that I could test out “reading like a grown-up” (verdict: boring, if not interestingly racy at times). I volunteered in the library while I was in elementary school so that I could get dibs on the new books that came in. And though I didn’t read under the covers with a flashlight, I would perch myself at the foot of my bed so that, even though my room was dark, I could catch the shine of the hall light to facilitate late-night reading. This was my biggest coup because, if I could do it and not get caught, I could read almost all night long. My dad is a newspaper editor, and at that time he worked until 2 or 3 in the morning. The hall light stayed on until he was home and getting ready for bed. If I could last until Daddy got home, I could get in some serious reading. I’ve never been a particularly fast reader, and I found this really vexing as a child. I like to loll the words around in my mouth, stop and imagine scenes, replay conversations in my head, marvel at vocabulary. But because I read all the time, I felt like I should be faster. Even now, I worry that being a slow reader is a fault, though I know that being a careful reader who glories in the details shouldn’t be something to be embarrassed about. The types of books I enjoyed as a youngster varied a great deal. I loved Beverly Cleary and Judy Blume. 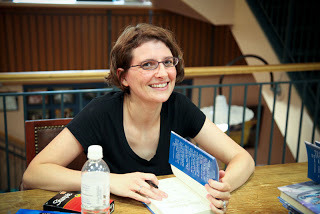 I devoured Paula Danziger and early Lois Lowry (three cheers for Anastasia Krupnik (Yearling))!. I read all of the Choose Your Own Adventure books (Bantam, 1979-1998), and puzzled over Encyclopedia Brown (1963-). I fully stole my dad’s book of collected Ogden Nash poems, and I broke the spines of my Shel Silverstein books by reading them so much. For some reason, I resisted a lot of prize-winning literature, and this is something I’m still trying to remedy. At the time, I was pretty sure that if a book had a metallic medal on the front, it was either going to be boring or sad, and I didn’t want to read anything like that. This means–even though I probably shouldn’t admit it–I’m still catching up on the classics. My all-time favorite books, though, out of everything I read, were written by Roald Dahl. The BFG (1982), The Witches (1983), The Twits (1980), James and the Giant Peach (1961). They were adventurous and scary. They took place in the real world–but not. Would you categorize Roald Dahl as fantasy? Maybe so. I loved how they introduced me to a kind of alternate reality–a world that I was absolutely convinced existed in real life; I just hadn’t been able to find it yet. Surely there was a place somewhere where frobscottle was real. Right? And so I think Roald Dahl is one of my biggest influences. He didn’t write sci-fi or speculative fiction really. No spaceships or aliens. But his worlds had that fantastical quality to them, and that’s what I love. That’s what I try to write. 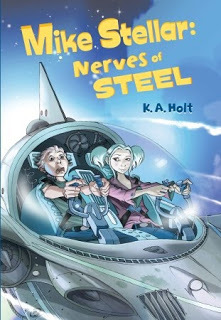 Mike Stellar: Nerves of Steel may take place mostly on a spaceship, but, to me, it’s about a regular kid, with regular problems, trying to figure things out in a not-quite-regular world. When I was writing Mike Stellar, I tried to be careful to not make his world too alien, too futuristic. I wanted the future to seem attainable, organic, like something that would seem familiar, but fascinating. I also tried to add a lot of “easter eggs”–little surprises for the careful reader. I absolutely loved to make discoveries when I read as a child, and I still do. For example, Mike’s teacher is named after a comet. The two major spaceships in the book are named after real ships sent to (or roving on) Mars. And so much more. Those kinds of connections are amazing. They’re educational without being didactic. I’m not sure kids get enough of that these days. I have three children. My oldest son is seven, my daughter is three, and my youngest son just turned one. I know it sounds impossible to get any writing done with a house full of children, and some days, believe me, it is. But the crazy thing is that I have done my best writing and my most organized writing after having children. Is it because I’m more mature now? More focused? Maybe. I think a lot of it, though, is that I have learned, for me, writing is a basic tenet of life. So it’s not that I have to make time for writing, it’s that I have to allow myself to not feel guilty because I have to write. The kids might have to watch more TV one day while I’m meeting a deadline. They might get some “just a minute’s” and “I’ll be right there’s” while I hammer out a scene that has just come to me. And, as a mom, I have to be okay with that. Or okay-ish. I try to be careful to not write much while I’m with the kids, though. For me, writing can be very all-encompassing; I lose track of time and space. I have been known to forget to eat or forget to sleep. So I try to take notes when I’m with the kids, but do most of my writing when they’re asleep. Writing at night has always been my style, though. It makes early mornings difficult, for sure, but those mornings are pretty satisfying when I wake up knowing that I got several chapters written the night before. I think if you’re the primary caregiver in your house and you’re trying to make a go of it as a writer, you have to pick your battles. It’s just like everything else. Is it okay to let the kids watch an extra round of TV shows so that you can finish writing out a conversation between your two main characters? Are you able to sneak away for a few hours when your partner comes home from work? Will finding a mother’s helper or a part-time pre-school help you be more productive? Will you sacrifice sleep for chapters? The answers to these questions all depend on who you are as a mama and who you are as a writer. The great thing about being a writer is that you can write anywhere on anything. I have been known to take notes on my arm while I wait in the car to pick my son up at school. You just have to find what works. I know that’s cheesy, but it’s true. Only you know how you write best.